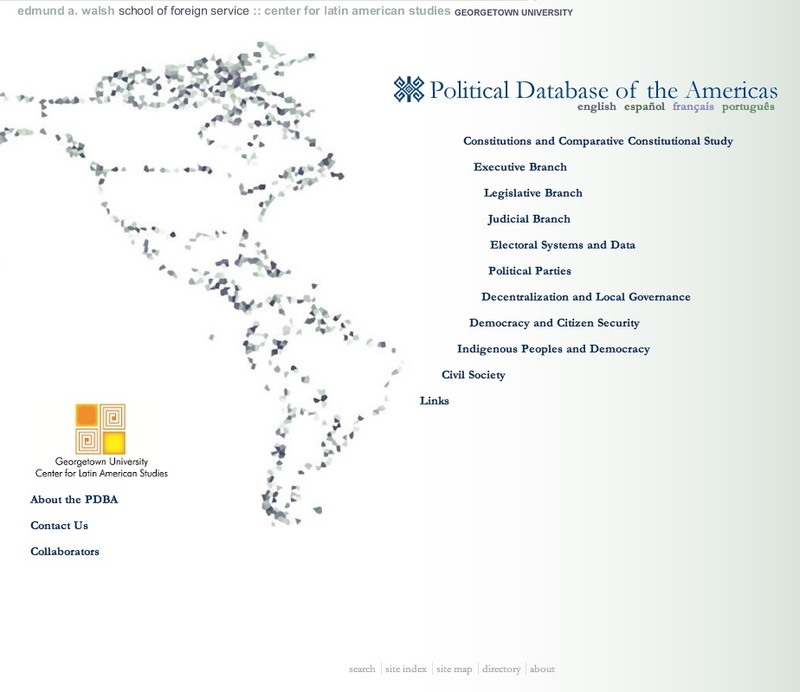 The Political Database of the Americas (PDBA) is an academic project developed at the Center for Latin American Studies (CLAS) at Georgetown University in collaboration with the Organization of American States, and other supporting institutions. The PDBA website provides more than 1,500 pages of info and data on the 35 states of the American region, mainly concerning their politics, government and society. Records consist in basic info about the political regimes (enriched with official documents like constitutions and laws) and political-administrative organization at different levels of government; and in a rich amount of pertinent and selective links to the executive, legislative and judicial branch, to other legal sources, to political parties as well as to civil society organizations. Particularly remarkable is the section with the election results for the countries of the Americas, which is a useful databank at hand. Short lists of references, compiled from other sources, are also provided for most topics in English, French, Portuguese and Spanish. Many contents and annotations are both in English and Spanish. Some pages are also in Portuguese and French. The PDBA pages have been recently refreshed and their content improved, but still not often up-to-date. Navigation is simple and the website index clear with its self-intuitive categories.